I found out February that my sister is expecting a baby in October. So I had to start crocheting right away, even though I still don’t know if the little one is a boy or a girl. My brother-in-law LOVES monkeys, so I decided that sock monkeys are gender neutral. 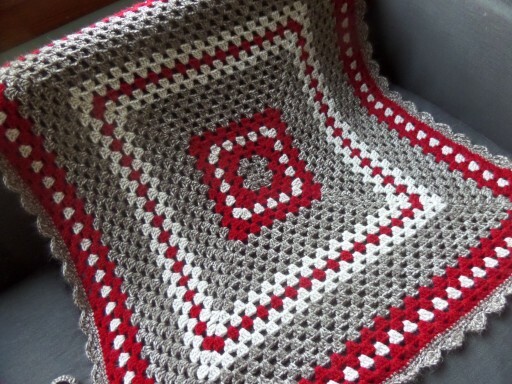 Okay, so the colors aren’t very feminine, but I added the scalloped edge on the blanket, just to soften it up a bit. 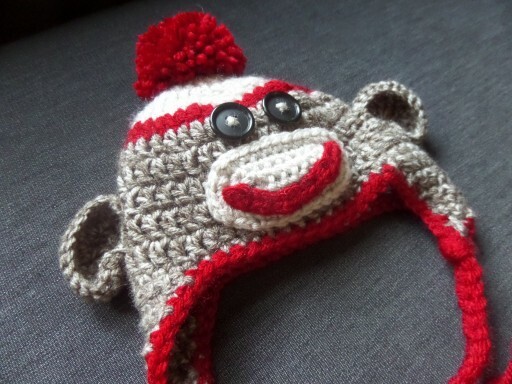 The hat pattern comes from Repeat Crafter Me, the same place where I got the owlie hat pattern. As always, the pattern is super easy to follow, she has detailed instructions for any confusing parts, and best of all, the pattern comes in all sizes from newborn to adult. I made the hat in newborn size. Little bean will need a hat, being born in Minnesota in late October. I just love the pom pom on top. I gets me every time. Little bean is going to look so adorable in this hat. 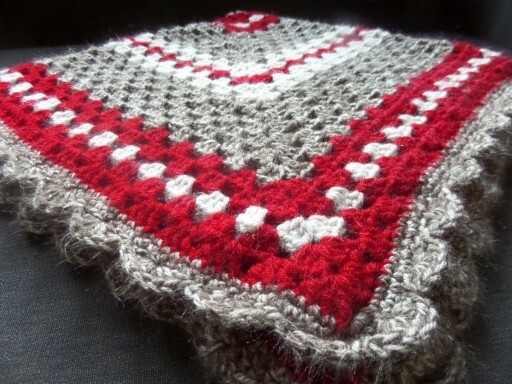 I used Vanna’s Choice yarn in Taupe Mist, Linen, and Cranberry. I was a little worried I wouldn’t find good “sock monkey colored” yarn when I walked into Joann’s, but the Taupe Mist is absolutely perfect. It is a mix between their linen and taupe colors, and it had just the tweedy look I was going for. The only thing I would caution is to make sure you get all of the same dye lots. They didn’t have enough of one lot, and the mix between taupe and linen was noticeably different between the non-matching skeins. This blanket has a different border than the one in the pattern. I made the scalloped border in Taupe Mist. First do 2 rounds of sc, then the scallops are made by doing a slip stitch, skip 2 stitches, 6 dc in same stitch, skip 2 stitches, slip stitch. Then skip 2, 6 dc, skip 2, slip stitch again. Continue that pattern all the way around. I had to fudge it a little to make the scallops end right at the corner. I would skip 3 stitches instead of 2 on a scallop or two so it would end correctly. You totally can’t tell on the finished blanket. The finished blanket is just about 36 inches square. The hat and blanket together took 3 skeins of linen and cranberry and 4 of taupe mist. The taupe mist came in smaller skeins so I bought an extra and I was sure glad I did. I had quite a bit left over cranberry and linen, but until the last side of the last round, I was sure I was going to run out of taupe. I finished with just a couple feet of yarn left. The blanket seemed a little wonky before I washed it. Not quite square and the stripes kinda rotated around the blanket a bit. I’m not really one for blocking, so I just ran it through the washer and dryer. It came out perfect and the yarn was so much softer. I always make baby things in 100% acrylic yarn. My items are meant to be used, and that means they’ll get dirty. They need to be machine wash and dry-able. I gave this to my sister as a Mom-to-be present on Mother’s Day. I think she liked it, and I’m sure the little one will too, once he or she makes his or her arrival. And once I find out if it’s a boy or a girl, I will have to start another, more gender appropriate gift. 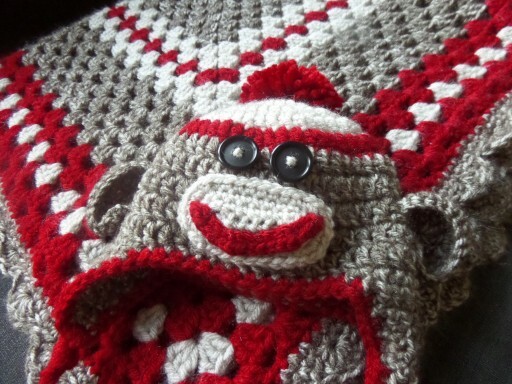 Edit: Check out my matching Sock Monkey Diaper Cover! 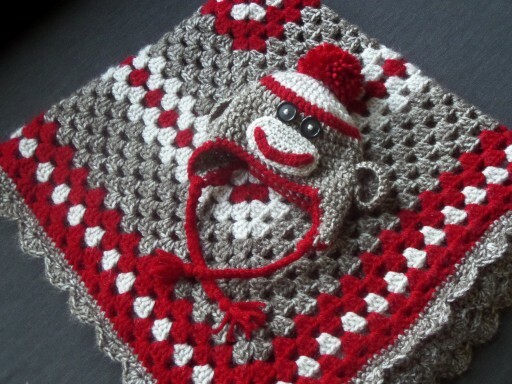 4 Responses to "Sock Monkey Hat and Matching Baby Blanket"
Can you tell me how much yarn you used for each color? It was one skein of cranberry and linen and I want to say 4, but maybe it was only 3, of taupe mist. The taupe mist came in significantly smaller skeins. I hope that helps!